Tristan has over 15 years of experience in the application of geoscience to environmental, groundwater and geotechnical projects, including working on some of the world's biggest LNG and iron ore mining projects. 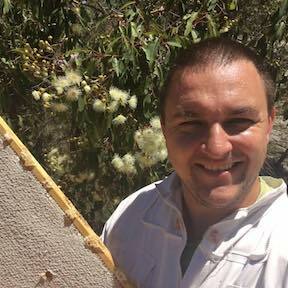 His PhD candidature is a combination of his professional experience with his hobby of beekeeping: using a combination of spectroradiometer, drone and satellite data to in an effort build a model to detect, and potentially predict, flowering Marri trees (Corymbia calophylla) which produce the largest honey harvest in Western Australia. He is active in the local community and industry, being on the board for the Rotary Club of Perth and the South-East Region Centre for Urban Landcare (SERCUL) and a member of the beekeeping section of the Department of Agriculture and Food's Agricutural Produce Commission. Shawn Bos is a PhD candidate undertaking a research project on hyperspectral classification using airborne data. His interests lie in many areas in physics but is especially keen on computational physics as applied to environmental science or quantum mechanics. His honours degree project used FORTRAN 77 to computationally model the Poisson equation in Density Functional Theory. After graduating from Curtin University, Shawn went on to develop a career involving computers. After putting himself through an MCSE, he successfully attained several system administration positions. He next turned to secondary mathematics teaching after completing a Graduate Diploma in Secondary Education. Currently, Shawn has returned to physics where he is completing his PhD in hyperspectral remote sensing. Algorithms were written in C++ (and some in FORTRAN 2008) to process the huge data sets necessary. Other languages utilised during the thesis included MATLAB, Matplotlib and ENVI.